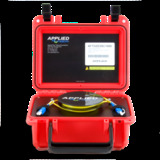 OTDR’s require a Launch Cable, Pulse suppressor, or Dead Zone Eliminator when measuring fiber loss from end to end, connector loss, splice loss or any reflectance of optical fiber links. Applied Fiber's Dead Zone Eliminators are customer specific regarding the type fiber, singlemode, multimode 62.5/125, multimode 50/ 125 (OM2) or multimode 50/125 (OM3). Select connectors from a full offering and they will be expertly installed to meet Telcordia and industry standards or better.